I must say, this was not only a quick card to make but a very fun one too. There's a lot of things going on in this card but yet it was quick to create. I do not know who the original designer of this card is but you can see the original card here. I did not add the bow on the ribbon. I was going to but forgot and I kind of like it without the bow. I may add it later but I doubt it. I used the Flower Shop punch on the Whisper White card stock. I stamped the words on. I used the retired "Bring On the Cake" set. 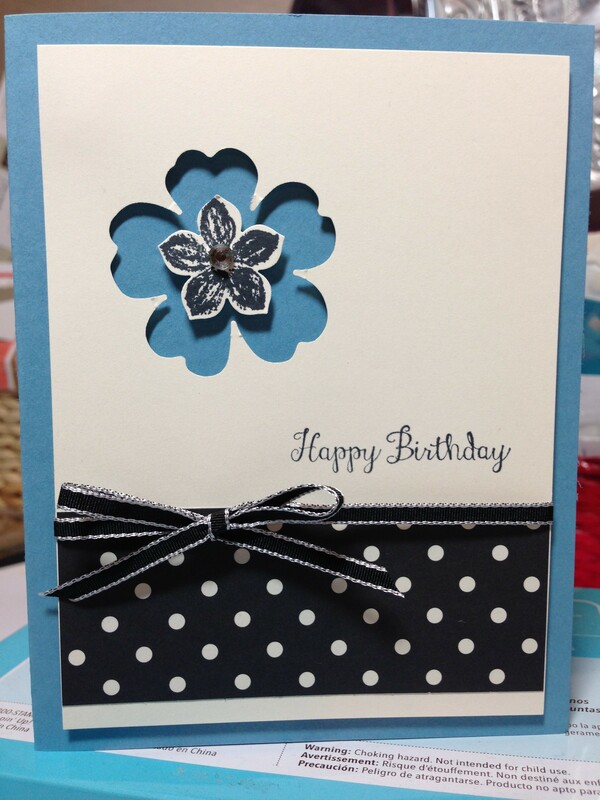 I stamped the "Petite Petals" image using black StazOn. The decorative paper is from the "Back to Black" pack. I added the ribbon strip and taped it onto the back. I like doing my ribbon that way. It makes it easy to add a knot that looks like a bow. Plus you can slide that knot where you want it and have your card look perfect!!! I set the Whisper White layer on a folded half sheet of Marina Mist, using Dimensionals. Once it was in place I then added the "Petite Petals" flower to the center, again using a Dimensional. I added a half pearl to the center and it was done. I told you it was quick!!! And fun too!!! I like the simplicity and quickness of this card. Very pretty!